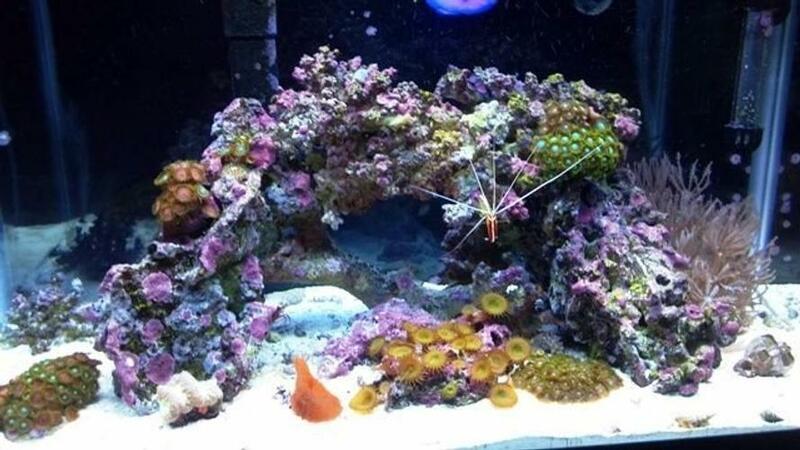 Live rock is the foundation for a thriving saltwater aquarium environment. 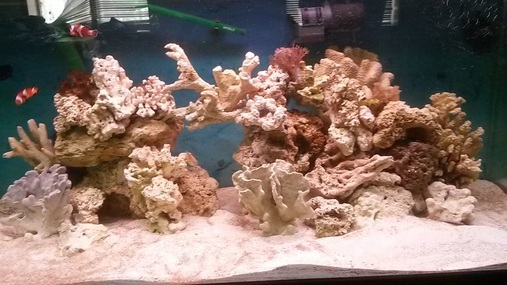 Live rock is the foundation for any thriving saltwater tank and it is the base for saltwater aquarium decor. Rather than spending a fortune purchasing natural live rock, consider customizing your tank by creating your own live rock. When it comes to decorating a saltwater tank, live rock is a must. Live rock consists of rock made from the aragonite skeletons of dead corals and other organisms – it is typically covered in coralline algae and other microscopic organisms that function as biological filters and serve to diversify the saltwater aquarium environment. Purchasing live rock for your saltwater tank can be expensive, so many aquarium hobbyists take the alternative route of creating their own live rock. In this article you will learn the basics of DIY versus natural live rock and receive tips for making your own live rock at home. You will also receive a step-by-step guide for curing purchased live rock to make it safe for use in your tank. There is a great deal of debate surrounding the issue of live rock in saltwater aquariums. 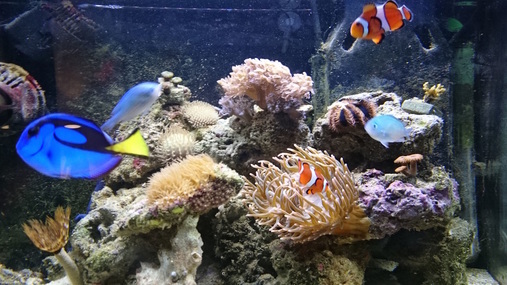 Many aquarium hobbyists argue that DIY live rock is a more eco-friendly option because it does not require taking live rock directly from the ocean. On the other hand, if it is properly harvested, natural live rock is a renewable resource – corals constantly grow and build new skeletons, thus creating new live rock. While DIY live rock may not be harvested directly from the ocean, however, the cement used to create it comes from finite resources including terrestrial limestone quarries. When you factor in the additional materials needed to make DIY live rock, there is no clear answer to the question which option is better. In addition to the issues surrounding the ecological impact of DIY versus natural live rock, you should also consider the benefits of each option. Real live rock contains a natural diversity of organisms that will help colonize sterile aquariums and create food chains for coral reef inhabitants. Natural live rock also has the advantage of being ready to use – you do not have to undergo a lengthy curing process and then introduce the bacteria and other microorganisms you want to inhabit the rock. On the other hand, DIY live rock doesn’t pose the same risks for introducing unwanted parasites and bacteria into the tank that natural live rock does. By making your own live rock, you also have the option to form it into whatever shape you like for a completely customized look. To make your own live rock you need to purchase two bags of aragonite sand (one fine, one coarse) and one bag of Portland cement. To begin, mix six parts aragonite sand with one part Portland cement to create a mixture called aragocrete – this mixture will form the base of your live rock. To mold your live rock, you will need to fill a large Styrofoam cooler or another similar container with aragonite sand and damped the sand so it is slightly moist. Next, dig a hole in the sand in the desired shape for your live rock. Try to make the shape as natural as possible – don’t make it a complete circle or oval. Once you have dug the mold for your live rock, pour the aragocrete into the mold and cover it with aragonite sand. Gently tap the sides of the box a few times to settle the sand then let it sit for at least 24 hours so it has plenty of time to harden. After the rock has hardened, soak it in white vinegar for 12 hours then rinse it well in fresh water. Before you use the rock in your saltwater tank, you should cure it in fresh water for at least one week, replacing the water once a day. You may also want to place start the rock in a grow-out system to begin a colony of coralline algae and beneficial bacteria. To do so, treat the water in the grow-out tank with a reef builder supplement and add some reef calcium. As your colony develops, keep an eye out for unwanted growths of algae. Don’t be afraid to get creative when building your own live rock. To make pockets or depressions in your rock, dig out a portion of the mold and fill it with aragonite sand. You could also try building a large cave by covering an inflated balloon with the aragocrete mixture – once the rock has set you can pop the balloon. To make tunnels in your live rock, roll up a piece of newspaper or cover a piece of plastic tubing with aragocrete to keep the tunnel open as the rock hardens. Experiment with a variety of shapes as you create your own live rock and, once it has cured, try out several different arrangements to see which looks best in your tank. Place your live rock in a 30-gallon plastic garbage can and pour in enough mixed saltwater to cover it. Install an aquarium heater and heat the water to a temperature of 80°F. Add an air stone or a powerhead to the garbage can to keep the water flowing constantly. Perform two water changes per week, changing 100% of the water in the garbage can each time. In between water changes, use a bristle brush to scrub the live rock, removing dead material and white film from the surface. Test the water in the garbage can every few days after the first week – when the conditions stabilize and you get a zero reading for ammonia and nitrite, your live rock is ready. In addition to following the steps listed above, you should keep the garbage can in a dimly lit area to prevent excess algae growth. If you follow these steps correctly, it should only take one to three weeks for your live rock to be cured. At that point, it is ready to be placed in your established tank. Live rock is an essential part of any saltwater or reef tank but you do not necessarily have to spend a small fortune to buy it. By making your own live rock you can save money and you can completely customize it to suit the needs of your fish and your particular tank. If you want to try making your own live rock, put the tips in this article to use and give it a try!